In years past when I photographed weddings at the Nixon Presidential Library & Museum, we had no problem entering the Museum with the bridegroom to capture a few portraits. However it appears at times have changed and couples getting married there are no longer allowed to enter the Museum area. That was a great disappointment to this bride and so a few quick words from the groom to the security guard gained us entry. We worked very quickly as I only had a few minutes to capture a few photographs and this was one of them. I created a photograph of a couple in the visor of the spacesuit many years before this photograph, that I was never wholly satisfied with the result. When I returned, I had a detailed plan as to how I was going to create a very special shot with the spacesuit — which just happens to be the spacesuit of Neil Armstrong. 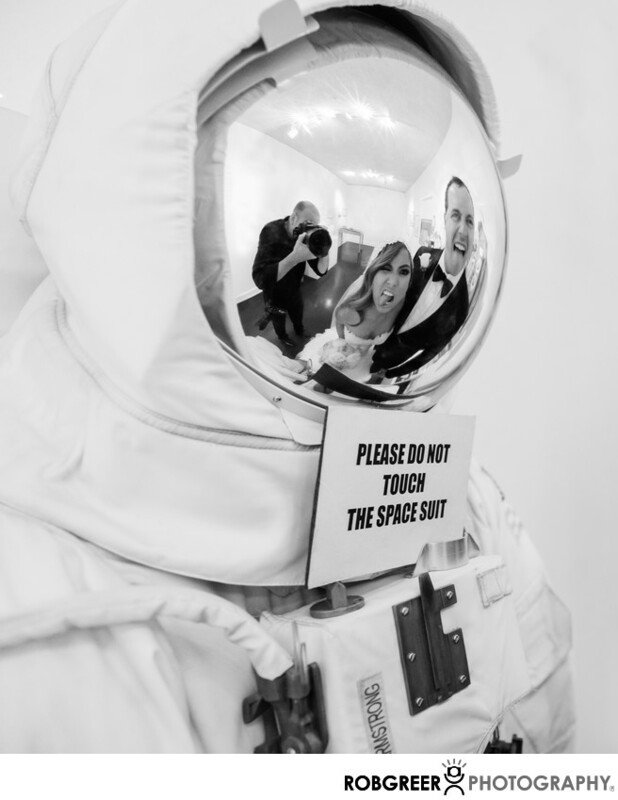 However, when we arrived, the spacesuit was in a small corner of the room and some of the surrounding signage prevented me from getting a clean photo of the suit and the couple. Thinking quickly, I came up with the idea of having this quirky couple make faces in the reflection. But because of the position of the spacesuit, I couldn't take a photograph that featured the bridegroom alone and so I decided that the only way to do a good job with the image was to place myself in the photograph as well. Although this image is nowhere near what I had in mind for this wedding, I'm certainly happy with the result and I'm proud to presented here in my wedding photography portfolio.Nixon Presidential Library & Museum is located in Yorba Linda, California. Phone: (714) 364-1181. Website: http://specialevents.nixonfoundation.org/. Location: 18001 Yorba Linda Blvd, Yorba Linda, CA 92886. Keywords: Nixon Presidential Library & Museum (3). 1/50; f/2.8; ISO 3200; 24.0 mm.